OfficeMate satisfies all of your practice management needs and maintains and manages patient demographic information that is easily entered and accessed. This includes such areas as marketing, recall, and insurances; patient schedules, which can be viewed by day or week as well as by provider. It also displays no shows, cancellations, balance, family members, and the last appointment. Final Rx information can be either manually entered or automatically transferred from ExamWRITER; and fee slips that clearly display products and services in a line item format and import diagnosis and procedure codes from ExamWRITER. OfficeMate also features FrameMate, which can be used to import frame inventory data directly from the FRAMES Data CD-ROM. It saves us so much time and paperwork!!! We like almost everything about this software. It is easy to book appointments, print receipts, create orders, bill insurance, etc. It is also integrated with VSP which makes billing those claims a breeze as well as with Weave which is great for our patient communications. There are so many awesome qualities to this software and as long as you fully use all that it has to offer, you will not be disappointed in purchasing it! Overall it's a very good Optometric EHR. Our office has been using it for 5+ years and have been happy for the most part.It's very easy to navigate through the medical charts and product orders in OfficeMate. It functions very efficiently and allows me to chart quickly and accurately while still interacting with patients. Our office has been using OfficeMate for almost 10 years, so obviously it is usable and will get the job done. It is lacking in several areas, and we are constantly looking for something else, but it is JUST GOOD ENOUGH to keep us from going through the headache of switching... Technical support is not good. Our IT staff has shown them how to fix certain issues on numerous occasions. The OfficeMate user interface is clean and organized and relatively easy to learn for new users. Able to perform all the daily functions of the optical with exception of inventory maintenance. If that ever gets corrected, it will be an unsurpassed program for offices.Simple layout. The system is designed for ease of use and does not take much training to have someone new step up and use it. Processing orders or patient information is seamless. The ability to glance at previous work is a benefit. It helps us to run our office on a daily basis. I love that it is super easy to enter in new patients and pull up information about their recent visits. Also having the ability to link family members to each other makes it super easy when making appointments for multiple people in a family. 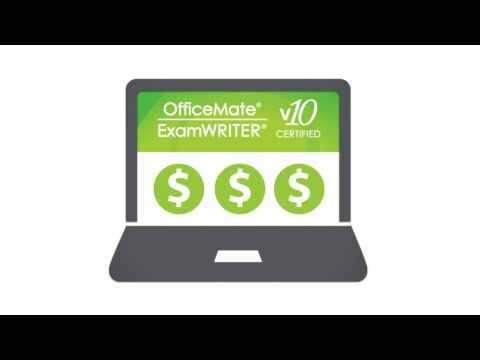 In addition, combined with ExamWRITER, OfficeMate is ONC-ATCB 2011-2012 Certified and can be used to attest to Stage 1 meaningful use under the HITECH Act. Below are some frequently asked questions for Eyefinity OfficeMate. Q. What type of pricing plans does Eyefinity OfficeMate offer? Q. Who are the typical users of Eyefinity OfficeMate? Q. What languages does Eyefinity OfficeMate support? Q. Does Eyefinity OfficeMate support mobile devices? Q. Does Eyefinity OfficeMate offer an API? No, Eyefinity OfficeMate does not have an API available. Q. What other apps does Eyefinity OfficeMate integrate with? Q. What level of support does Eyefinity OfficeMate offer? Q. Which apps is Eyefinity OfficeMate compared to most often?